Here are iSmiledYou's top 10 blog posts, most visited, shared, loved by you, in March 2014! 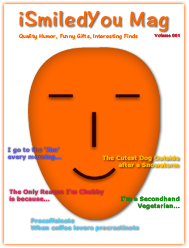 March, marked the launch of iSmiledYou's quarterly humor magazine iSmiledYou Mag! 3. Top 8 Self-help Books on Being Happy this year! And here are my picks - my favorite, funniest, top 5 blog posts, of March 2014! There were a total of 3,931 visits to iSmiledYou in March, of these 3,714 were unique visitors, and the total number of pageviews was 5,206.